Snacks and movies are what Saturday nights are made of. 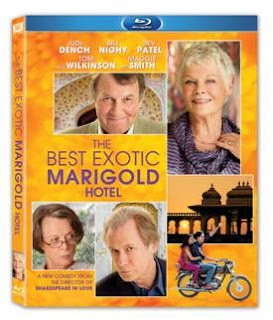 In the near future, we will be pre-viewing 20th Century Fox Home Entertainment's: The Best Exotic Marigold Hotel on DVD September 18th, at which time we will also be enjoying a British/Indian gift basket to truly enhance our movie experience. This award winning feature starring Judi Dench, Bill Nighy, Tom Wilkinson, and Maggie Smithfocuses on a group of British retires looking to outsource their golden years to India. However, they find their destination, the Best Exotic Marigold Hotel much less than what they have originally anticipated. The movie is charming and sweet with subtle humor that will keep the audience entranced in the storytelling. Through their journey the seniors find out that it is never too late to start over again, and that love and surprises can be found around every corner of the world. The movie is said to be a true portrayal of old age and what it can bring. Filled with vivid Indian scenery with bright and vibrant colors it will make any viewer want to back up and outsource their lives to India. Be sure to watch out for my upcoming review of this film.